With a growing popularity among young people, this city in the west of Tokyo has been voted the No.1 place where people want to live in Japan numerous times. 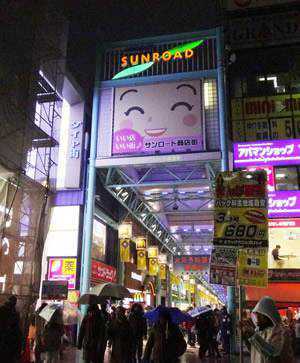 To the north side of Kichijoji runs a pedestrian-only street called Sun Road. The street is lined with many affordable restaurants and shops, which makes it popular among locals. Some of the shops include ramen restaurants, shoe stores, 100-yen shops, apparel shops, and sushi restaurants. Sun Road is often bustling with people in the evening; even on rainy days, as the whole length of the road is roofed. To the south of Kichijoji station is Inokashira Park. The park is especially crowded during the hanami season when people come to watch the blooming cherry blossoms. Many fancy restaurants and exotic souvenir shops occupy the area between the park and the station. Although not exactly fancy, there is also a famous store, Iseya which serves Yakitori(barbecued chicken skewers) in the area. On the northwest side of Kichijoji are Parco, a department store, and Nakamise Shopping Street(仲見世商店街), a street lined with cozy restaurants, cafes and unique stores selling import items. Keio Inokashira Line at Kichijoji Station. 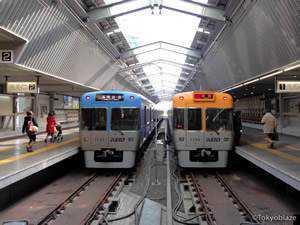 Kichijoji can be accessed easily from Shinjuku and Shibuya via JR Chuo/Sobu Line and Keio Inokashira Line, respectively. Keep in mind that some Chuo Line rapid trains do not stop at Kichijoji.